The Infinity Gems, are some of the most powerful artefacts in the Marvel Universe. Whoever wields the infinity gauntlet holds the power of creation itself and has the ability to do anything they desire. 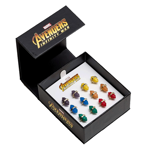 Now you can wield the power of the infinite with these gorgeous Infinity Gem earrings. This Infinity gauntlet mug is a must have for any Marvel fan!